Near the shadow of the Walt Whitman Bridge in Gloucester City, NJ resides one of the best track coaches in the country. Jack Pyrah, now 87 years old, spent 26 years as Villanova assistant track coach under legendary Villanova coach Jumbo Elliott and 26 years as Villanova’s head cross-country coach. Elliott, considered by many to be the best American distance coach of all time, coached at Villanova for 47 years before passing away in March of 1981. Jack joined Villanova as Jumbo Elliott’s assistant track coach and head cross-country coach in the fall of 1966 after meeting Elliott in spring of 1965 on a plane on the way to a Knights of Columbus track meet in Cleveland. Jack retired from Villanova in 1991 and is now considered Villanova “coach emeritus.” Upon his retirement, Villanova presented Jack a unique gift--the offer to accompany the Villanova track or cross-country teams to any meet in the country. Jack was inducted into the Villanova Wall of Fame in 2001. Jack didn’t know when his Uncle George took him to his first Penn Relays in 1934 at age 16, that he would attend 73 Penn Relays in a row, and that he would witness an incredible 54 Championship of America relay victories by Villanova at Penn. More importantly, that first trip to Penn started in motion a lifetime love affair with running and track and field, and a lifetime of friendships with some of the greatest track-and-field athletes of all time. Jumbo Elliott once said of Jack, “That Pyrah has the mind of a computer when it comes to track.” A visit with Jack reveals not much has changed. Jack still retains an encyclopedic knowledge of current and past runners and of course the famous Pyrah sense of humor. Jean Pyrah, Jack’s wife of 49 years, just smiles. Jack had a series of health problems in December including a heart attack. Jean acknowledges Jack’s health problems gave everyone a scare and that Jack is currently pursuing physical therapy to build up his strength. A visitor can’t help but notice the similarity between the workouts and dogged mental toughness of the world-class runners Jack coached and the way he pursues his own current physical therapy--a walking trip the length of his Gloucester City street and back and some stair repeats in his house conjure up visions of Sydney Maree, Marcus O’Sullivan, and Don Paige pushing themselves through a workout on Villanova’s track or on the hills close to campus. Jack grew up in the Germantown section of Philadelphia and graduated from Germantown High in 1937. He began his coaching career at Philadelphia’s Shanahan Catholic Club in 1942 in Philadelphia. Jack coached 18 Olympians at Villanova including Eamonn Coghlan, Marty Liquori, Sydney Maree, and Villanova’s present head coach Marcus O’Sullivan. Jack stepped in and became Villanova’s head track coach in 1981 when Jumbo passed away on March 22, 1981. 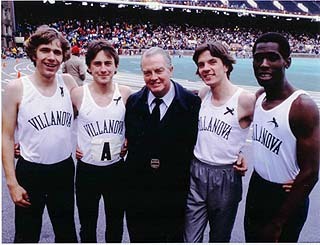 During his years as head coach, Villanova won three Penn Relays titles and the school’s first Big East Conference Championship. When former Olympian and Villanova alum Charlie Jenkins was hired at the end of the season, Pyrah went back to his previous coaching duties of head cross-country and assistant track coach. “That Pyrah has heard more sad stories [from Villanova runners] than a bartender,” Jumbo Elliott said once. “He’s so nice, so understanding that some of the runners call him ‘Mother Pyrah.’” Many of Jack’s runners, now spread around the globe, keep in touch with him still. During his illness and at his birthday it’s common for Pyrah to hear from many of his former runners around the country and around the world. Jack is proof that good guys can finish first. Jack won eight IC4A and an incredible four NCAA championships (1966, 1967, 1968, and 1970) as head cross-country coach at Villanova. The 1970 title was famous because it was won after Irish runner Donal Walsh demanded that a film of the race finish be reviewed in order to prove that a Villanova runner had finished ahead of other point scorers and had been passed in the finish chute. When asked for his favorite Penn Relays memory, Jack recalls Larry James winning the 1968 mile relay at Penn, running a 43 quarter and beating a kid from Baylor who ran “only” a 45 second quarter mile. James, a Gold and Silver medallist at the 1968 Olympics in Mexico City, ran on the World Record 4 x 400 relay team (2:56.16) and is now the Athletic Director at Stockton. Jack has also been a long-time track official in South Jersey until his recent health problems affected his mobility. Jack won’t bring it up but he has a major track meet named after him, the “Jack Pyrah Invitational,” held the first week in December at Villanova. When Marcus O’Sullivan went on a recent recruiting trip to Kenya, he met former Villanova distance great Amos Korir. Marcus said, “Amos’s first question was ‘How is Jack doing?’” Jack was Amos’s coach at Villanova. Jack was introduced to his wife, Jean, by Browning Ross. Jack and Jean married in 1957. Jack said, “I told Browning it’s the best thing you’ve ever done. More important than all of those trophies you won and all of the electric cooking machines you’ve won at races over the years!” Jean recalled Browning and Jack’s long friendship. “When those two got together they could just spend hours just laughing about the smallest things.” Jack closed his eyes and smiled at the memory. On a personal note, over the years Jack has been an enormous help to me in my own coaching career at Gloucester Catholic. With his easy-going nature, sense of humor, friendship, and expert knowledge of the sport, Jack is a great person to compare notes with and has been a huge help to me. He has even helped me brainstorm trying to think of ways to get more kids out for the cross-country team in years when numbers were small for either the boys’ or girls’ teams. To meet Jack Pyrah is to understand why so many runners--from Olympian Jim Ryun, to his Villanova greats, to local high school runners--make a beeline to talk to him when they see him.